DESPITE ITS age, the Peugeot 208 GT-Line is still a stylish and fun-to-drive vehicle that offers good levels of practicality. The only snag: if you’re taller and your body has amassed kilos its not for you- the leg room is a mission. 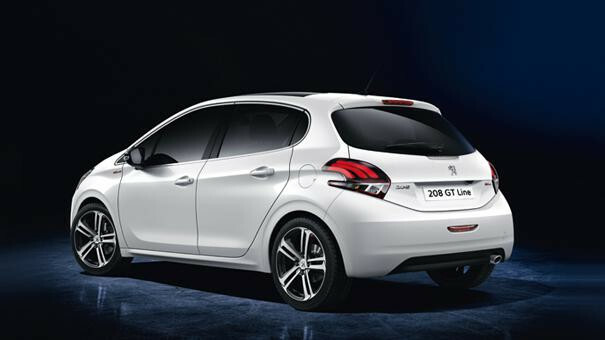 Peugeot 208 GT-Line is stylish and fun-to-drive. It claimed 0-100 kph: 9.6 seconds with top speed: 190 kph on curves and hills of the majestic Mpumalanga, and offers above-average performance: its 81 kW 1.2-litre turbopetrol engine is reasonably refined and its relatively generous torque figure of 205 Nm not only provides ample shove in cut-and-thrust driving conditions, it makes the 208 feel more lively than we expected. It corners confidently and the small steering wheel oddly instils the impression of greater control, which boosts a driver’s confidence. It’s fun to play with, and we did. For yours truly, its more of an alternative-choice “boutique” compact hatchback. In terms of fuel consumption, GT-line claims 5.7 L/100km; we averaged an indicated 7.3 L/100 km during our sojourn as we traversed three provinces, which is quite fair. Even petrol attendants were smitten with its tank capacity. You can, however, expect a fair degree of initial turbo lag when you mash the pedal to the floor. We found the auto to have a positive action through the gears. Useful standard features include automatic dual-zone aircon, cruise control, electric windows and mirrors and rain-sensing wipers, considering the rain-washers we went through. The build quality of the interior is good and the sporty partial GT Line sports seats are comfortable with generous bolstering for added lateral support. 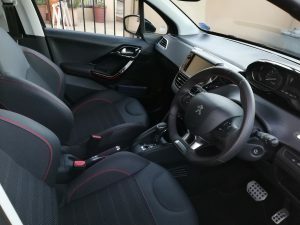 The safety specification offered on the 208 GT-Line is reasonable and includes 6 airbags, ABS with EBD, brake assist and stability control with traction control. Isofix child seat anchors are also standard. The rear seatback splits 60/40 and, when its folded down, a claimed 1 152 litres of utility space becomes available. However, the rear seats don’t fold completely flat. In terms of practicality its offers a sizable luggage bay (311 litres) and unfortunately some of my eggs (given to by my sister cracked) as a result of luggage in the boot. The GT-Line derivative has a bit more visual flair than other 208 derivatives thanks to its wider grille, flanked with new headlights. The grille itself is unique to the GT-Line and features eye-catching touches. The side mirrors are also painted black for added contrast and the rear is unmistakable with those eye-catching LED “claw” tail lights. The look of this 208 GT-Line is topped off with 17-inch Caesium alloy wheels. The leather interior of GT-Line. Image SLM. It might not appeal to all and sundry but me think that its distinctive looks will appeal to young urbanites or first time drivers. Competition would come from the likes of VW Polo TSI, Toyota Yaris S and probably Opel Corsa Turbo Sport. Try it on a long haul- you’ll love it though. The price includes a three-year/100 000km warranty and three-year/45 000km service plan.